Comments: The Eastern newt has a natural range covering most of eastern North America. Kansas is on the western edge of this range and it occurs only in a few of the extreme eastern counties. 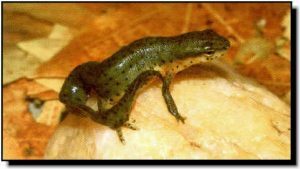 This salamander has an intriguing life history that begins aquatic, becomes terrestrial, then returns to an aquatic existence. The larva begins its aquatic life in a woodland pond, marsh or slough. The terrestrial existence (known as the eft stage) may last from one to several years. At this stage, it is brightly colored red-orange which is useful in warning predators of its toxic and irritating skin secretions. After the eft stage is completed the salamander returns to the water permanently as an adult. Sometimes the eft stage is skipped and the newt remains in the water as an aquatic subadult with remnants of the larval gill still visible. The Eastern newt does not have the distinct vertical indentations (costal grooves) between the front and back legs that are found on other Kansas salamanders.